When I was asked to create the Chinese herb pharmacy in our small town’s herb shop, HAALo, one of the first herbs I brought in was monk fruit. It has come to be known as Monk balls in our town because of its legendary use by the Guilin monks. Monk fruit, a calorie free low glycemic index sweetener, has been gaining popularity as people strive to fulfill their sweet craving without spiking their blood sugar or gaining weight. Body Ecology’s Donna Gates recommends it as a sweetener that does not feed candida or other yeasts. It has been used in China safely for diabetics and obesity. Chinese nutrition is about balance of the five flavors: bitter, sweet, sour, salty, and pungent. It is natural to crave sweet, and it our body’s way of telling us we need energy. But sweet comes in the sweet of asparagus or yams. Too much sweet depletes energy and causes digestive weakness, which then leads to a cascade of issues like bloating, loose stools, fatigue. These symptoms may then lead to diabetes, high cholesterol, or high blood pressure, all signs that our body is having trouble processing the foods we eat and is overloaded with the sweet byproducts it couldn’t digest. For those times when you just want a taste of something sweet, your healthiest alternative is monk fruit, most commonly known now as lo han, or another healthy choice is stevia. Both are plants with naturally occuring sweetness, and, unlike aspartame and other artificial sweeteners that have been cited for dangerous toxicities, they are safe, natural alternatives that are ideal if you’re watching your weight, or if you’re maintaining your health by avoiding sugar. I recommend using lo han in moderation, just like sugar. In excess it is still far less likely to cause metabolic problems than sugar or any of the artificial sweeteners. If you have insulin issues, high blood pressure, high cholesterol, diabetes, or extra weight, it may be best to avoid sweeteners altogether, including stevia, as they all may decrease your sensitivity to insulin. With sweet cravings it is important to cultivate a taste for bitter to decrease the stimulated sweet taste buds, thereby decreasing the desire for sweet. 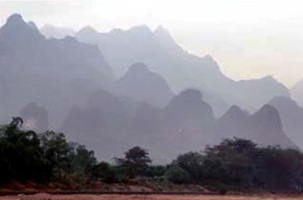 In the cucurbitacea family, the family of melons, it is said to have grown in the forested mountainsides of the Guaxi Province, home to the Guilin Monks in the 13th century. Most of them lived past the age of 100. It remained a longevity secret amongst the monks for many years. The fruit (guo, a term used mainly for gourd-like fruits) is named after the luohan, which are advanced Buddhist practitioners. With a limited natural growing area, mainly mountainsides in China, and some areas of Thailand, it has been difficult to cultivate successfully. It is only recently that it is being grown successfully on a non-GMO farm in New Zealand. Monk fruit, Momordica grosvenii, has been used in China as a sweetener and a healing medicinal herb. It is used as an extract to sweeten bitter medicinal teas, to revive one from heat exhaustion, or high fever, for almost any pulmonary condition, and for longevity. As an expectorant it also relieves sore throats. The elemental energetics of lo han is cooling, moistening to the lungs, and generating fluids for severe thirst or dry throat. It clears heat from the Lungs, moistens and stops cough. It is neutral and sweet and goes to the lungs and spleen. 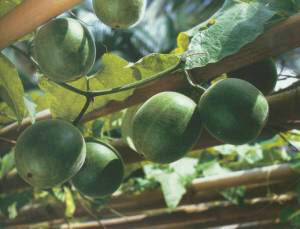 Lo han is collected as a round green fruit that turns brown upon drying. The sweetness comes from a naturally occuring, intensely sweet compound called mogrosides, a group of terpene glycosides, present at the level of about 1% of the fleshy part of the fruit. The mixed mogrosides are about 300 times as sweet as sugar by weight, so that the 80% extracts are nearly 250 times sweeter than sugar. In the 90s, Proctor and Gamble pattented lo han as a sweetener, but the taste is more complex in flavor, emitting a slightly complex bitter and nutty taste in addition to sweet. They are currently trying to isolate compounds, to extract only the intense sweetness. Meanwhile, everyone and their mother are making sugar substitutes from it. I strongly recommend using lo han as a liquid extract or as a powder of just pure lo han fruit. There are many products coming out that include other ingredients, that I do not recommend using. Some even contain sugar! Lo Han….what is the best way to use? The best way to use it is in its oven roasted herb form, which is how it comes from China, and either made into an extract or powdered and added to foods. Nectresse; contains lo han from BioVittoria’s Fruitsweetness, erithrytol ( a fermented corn sugar), sugar and molasses. Not recommended. Lou han sweet by Jarrow: contains lo han and xylitol. Better. Fruitsweetness by BioVittoria in New Zealand (the ones currently growing it successfully): pure lo han fruit concentrate powder. Seems interesting and clean. I will try this one. BUT! Processing anything in the extreme can change how our bodies recognize foods as useable fuel. So again, I would say use it in its natural form as best you can. Here are a few recipes some I found and some from friends who are getting quite creative with monk fruit! Victoria is a GAPS certified functional nutritionist from Kentucky. Here is her Blackberry Cobbler. Substitute powdered monk fruit for the manzanita sugar. Teas: The best way to brew tea is to use one monk ball in about a gallon of water. Bring to boil and simmer for 30 minutes. You can use this sweet base to add other ingredients to depending on the time of year. This fall season I recommend elderberries to support a healthy immune system; add in the last five minutes. Yerba Santa is another local plant that will enhance lo han’s lung healing abilities, for sore throats, coughs. In the summer add in flowers like rose petals, chrysanthemum flowers to enhance the cooling calming abilities. Rachel of of Sierra Botanica is a teacher and herbalist.Here is her Monk Fruit Thai Iced Tea: Take 2 balls, crush them well, put them in a quart jar, pour boiling water over them. Let cool. Add heavy cream or half and half! Drink on a warm summer day. You could drink this warm, add cinnamon for the cooler seasons, and use coconut milk if you are dairy free. Please write in with recipes you have to share! ← Pearly Everlasting is Bloomin! Where can you buy Fruitsweetness by Biovittoria? I would love to try it too but can’t find any information about where to purchase, even on Biovittoria’s website. It is not something I have purchased. I noticed the same thing on their site. Perhaps call! Very informative article on Luo Han Guo, thanks!